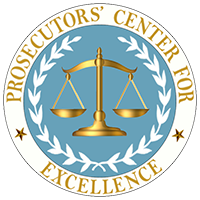 CHICAGO — July 19, 2015 — Kristine Hamann, visiting fellow at the Bureau of Justice Assistance/Department of Justice and former executive assistant district attorney at the Manhattan District Attorney’s Office, today announced the launch of the Prosecutors’ Center for Excellence (PCE). PCE, a national, non-profit think tank, will provide expertise and research on improving the criminal justice system, emerging issues and other policy matters relevant to prosecutors. The announcement was made this week at the National District Attorneys Association’s summer conference in Chicago. Hamann, the founder and executive director of PCE, has spearheaded the best practices movement that continues to grow as prosecutors around the country develop statewide best practices committees. These non-partisan committees represent all regions of each respective state, and are dedicated to positive change and improvements in the current criminal justice system. As of July 2015, prosecutors in 20 states have formed a Best Practices Committee: Arizona, California, Colorado, Delaware, Idaho, Illinois, Kansas, Louisiana, Maryland, Michigan, Minnesota, Missouri, New York, North Carolina, Pennsylvania, South Carolina, Tennessee, Utah, Virginia and Washington. More are under consideration. Throughout the past year, Hamann has met with senior prosecutors from 30 states in Best Practices Summits throughout the U.S. Funded by the Bureau of Justice Assistance (BJA), the summits have offered open forums for collaboration among senior prosecutors on the successes and challenges in establishing and running statewide prosecutor committees. These summits contributed to the formation and development of statewide best practices committees and the creation of Prosecutors’ Center for Excellence. BJA is a part of the U.S. Department of Justice whose mission is to provide leadership and services in grant administration and criminal justice policy development to support local, state, and tribal justice strategies to achieve safer communities. PCE will continue to sponsor national summits for prosecutors.